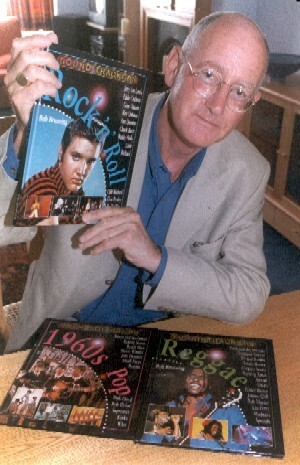 I've written twelve books about music, two for adults and ten for children. This year, I'll be writing the official history of the 100 Club, London. Watch this space! "Blues: The British Connection", a history of blues music in the UK, was published in 1986 by Blandford Press (ISBN number 071371587), and republished as "Blues in Britain" in 1995 (ISBN number 071372457 - 9). An updated version will be republished in the Autumn of 2002, by Helter Skelter, Denmark Street, London. "Fleetwood Mac: Behind The Masks" was published by the New English Library in 1990. An updated and retitled version was published as Fleetwood Mac, the First 30 Years by Omnibus Press (ISBN number 0711969078) in 1998, and is currently available. I have also written ten books for children for Heinemann for our "Sound Trackers" series. Six have been published: Rock 'n' Roll, 1960s Pop, Reggae, 1970s Pop, Heavy Metal, and 1980s Pop. In the Autumn of 2002, four more will be forthcoming: Blues, Jazz, Soul, and The Ninties.